Microsoft has brought the world’s most popular productivity suite to the cloud with Office 365. Word, Powerpoint, Excel, and more are now available online 24/7. Of course with every new Office 365 account, there is a user identity – a set of log-in credentials. We’ve written before about the risk of identity sprawl and the benefits of consolidating identities. It’s now possible to have users’ Office 365 identities function as the core identity – capable of authenticating access to all IT resources and infrastructure, including WiFi access points. 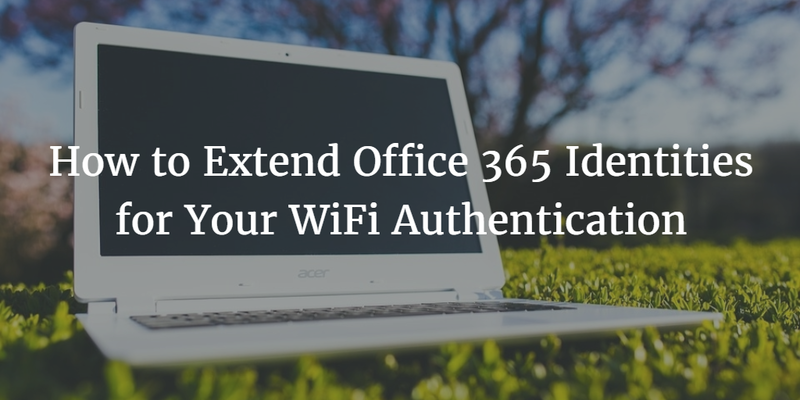 Here we’ll explain how it’s possible to extend Office 365 identities to your WiFi. Introduced in 1991, RADIUS is still the premiere protocol used for authenticating and authorizing users to login to a wireless network, via WPA2 Enterprise protocol on WiFi access points. Since RADIUS is a network protocol, there are many implementation of RADIUS servers, including FreeRADIUS (a popular open source RADIUS server), Microsoft NPS, Cisco ISA, ClearBox, Elektron, and many others. The greatest strength of RADIUS is its flexibility. It can perform authentication and authorization against just about any user directory source. RADIUS supports a long list of authentication protocols and client integrations. RADIUS is one part of the key to getting O365 identities to authenticate WiFi access. The other part is a central user directory that can actually traverse the wide range of infrastructures and resources in use today at the modern office – including WiFi. A unified cloud directory must work with RADIUS along with a wide variety of additional protocols (including SAML, LDAP, SSH, Kerberos and OAuth). That’s the only way that a virtual directory can truly unify identity management for IT. The way it works, you don’t actually have to manage the RADIUS server yourself. That’s why it’s often called RADIUS-as-a-Service, managed RADIUS, or outsourced RADIUS. Hooking Office 365 up with a Cloud Directory that uses RADIUS is the only way to extend O365 identities to WiFi authentication. Once you choose a cloud directory service and import your existing users, you can hit the ground running with complete control over each user who logs on to the WiFi network – including provisioning and deprovisioning access with the click of a button. Of course, not all cloud directories (also known as virtual identity providers or Directory-as-a-Service®) are built equally. Some don’t have native support for Office 365 built-in. That’s why it’s important to select your directory services carefully. 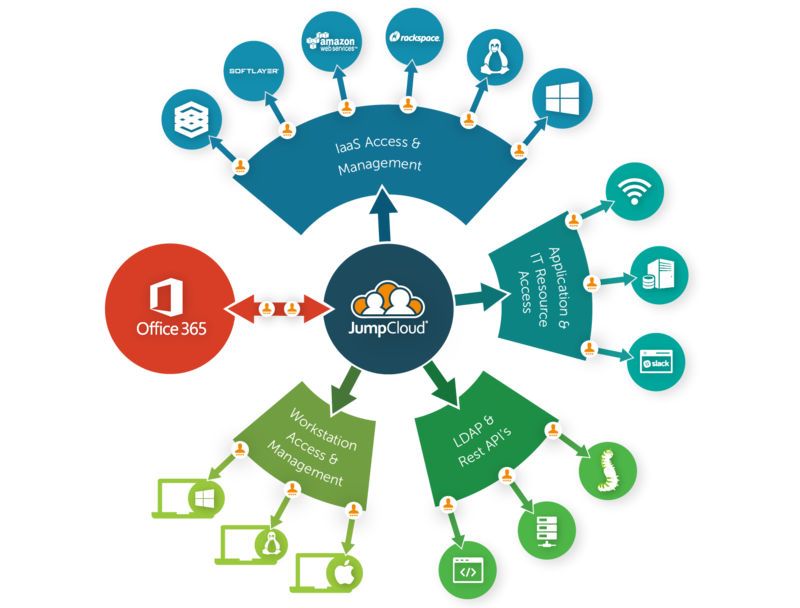 As you can see, JumpCloud brings your Office 365 identities to Infrastructure-as-a-Service (including AWS, Softlayer, and Rackspace), WiFi, Servers, LDAP, Rest API’s, and all of your workstations, including Windows, Linux, and Mac OS X machines. Getting started with DaaS is easy – and free forever for your first 10 users. If you want to learn more, you can contact us directly with questions or sit in on one of our weekly product onboarding demos.